Kepolisian Negara Republik Indonesia - POLRI is the Indonesian National Police. POLRI is the national police department of Indonesia and is an independent state institution in Indonesia with main tasks to maintain law and order, enforcing the law, providing protection, shelter and services to the public. POLRI is responsible directly under the President of Indonesia. POLRI was initially established in 1946 under the Indonesian National Armed Forces (TNI). Later in 1999, POLRI offically become an independent institution separated from TNI. Headquartered in Jakarta, POLRI now has 31 regional police commands (Polisi Daerah or Polda) spread in all over Indonesia. The Indonesian National Police is headed by a Chief of the Indonesian National Police (Kapolri). 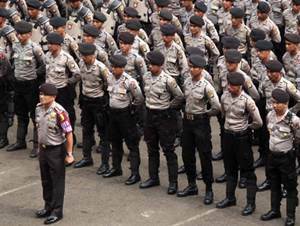 Since April 2015, the Chief of the Indonesian National Police is Police General Badrodin Haiti. He was sworn by the President Joko "Jokowi" Widodo as the Chief of the Indonesian National Police replacing Police General Sutarman. D4 Ahli Nautika Tk III. Indonesian Citizen (Male or Female). Faith and fear of god almighty. Loyal to the Unitary Republic of Indonesia under Pancasila and the Constitution of the Republic of Indonesia in 1945. Maximum age of 33 years old (S2 profession), 29 years old (S1 profession) and 26 years old (S1/D4). Authoritative, honest, fair and behave beyond reproach. Willing to be placed throughout Indonesia and willing to be assigned in all areas of police work. JobsCDC.com now available on android device. Download now on Google Play here. Please be aware of recruitment fraud. The entire stage of this selection process is free of charge. POLRI - Recruitment D4, S1, S2 Fresh Graduate SIPSS Program POLRI February 2016 will never ask for fees or upfront payments for any purposes during the recruitment process such as transportation and accommodation.